Alexander Clement Foster Gough – Grandfather of Stan Laurel? Alexander Clement Foster GOUGH was a wealthy Wolverhampton solicitor who died - apparently unmarried - in 1892. 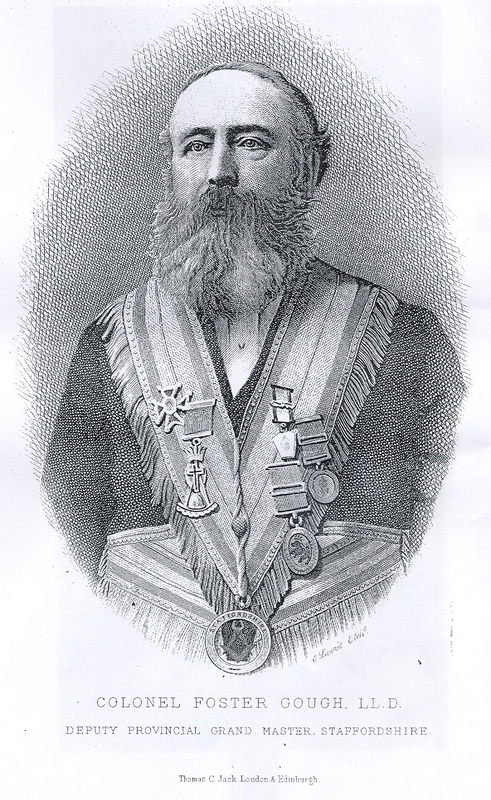 He lies buried in Wolverhampton Cemetery, where a large and rather ostentatious monument was erected to his memory. and his sister Clara, wife of J. Mitchell Riley of 51 Fairlawn Street, Greenheys, Manchester. This Arthur Jefferson was undoubtedly the father of the comedian Stan Laurel (of Laurel & Hardy fame), whose real name was Arthur Stanley Jefferson and who was born in Ulverston in 1890. Arthur Jefferson senior was a prominent theatre manager in the north-east of England in the 1890s and early 1900s. But why did Alexander Gough leave him £500? This was quite a substantial legacy, probably nearer £50,000 in today’s money. Arthur Jefferson’s origins are shrouded in mystery. In her book Teach yourself - Tracing your Family History (1997), the genealogist Stella Colwell described her extensive but inconclusive attempts to discover his parentage. At his first marriage in 1884 he named his father as Frank Jefferson, Solicitor, whereas at his second marriage in 1912 he claimed that Christopher Jefferson, Gentleman (deceased) was his father. No evidence could be found that either of these men ever existed. Greenheys and Chorlton-on-Medlock are adjoining districts of Manchester, located a couple of miles south of the city centre. It seems likely – despite the inconsistent age and birthplace – that this is the same Clara, and that the “nephew“ William was really her illegitimate son. DIED: On the 13th inst., at Walmer Terrace, Soho Hill, Handsworth, Alice, third daughter of Mr. Alexander Gough, solicitor, of Wolverhampton. 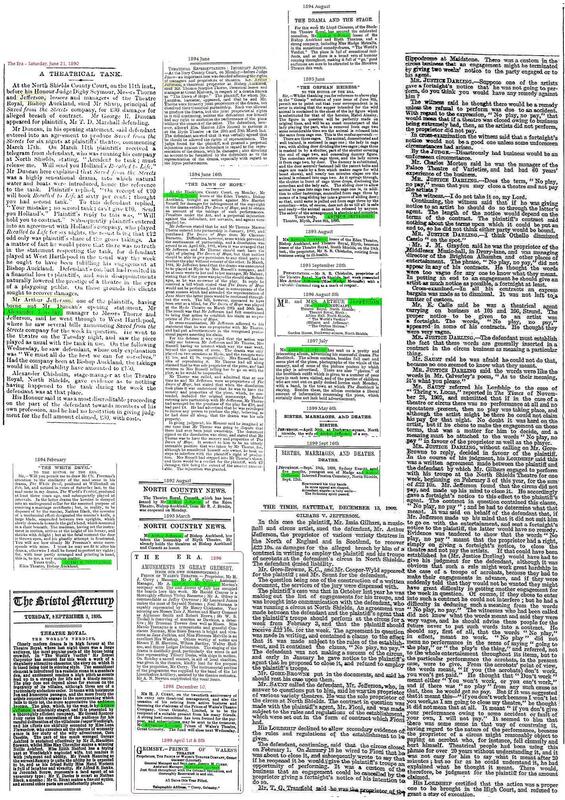 Similar notices appeared on the following two days in the Birmingham Daily Gazette and in Aris’s Birmingham Gazette. 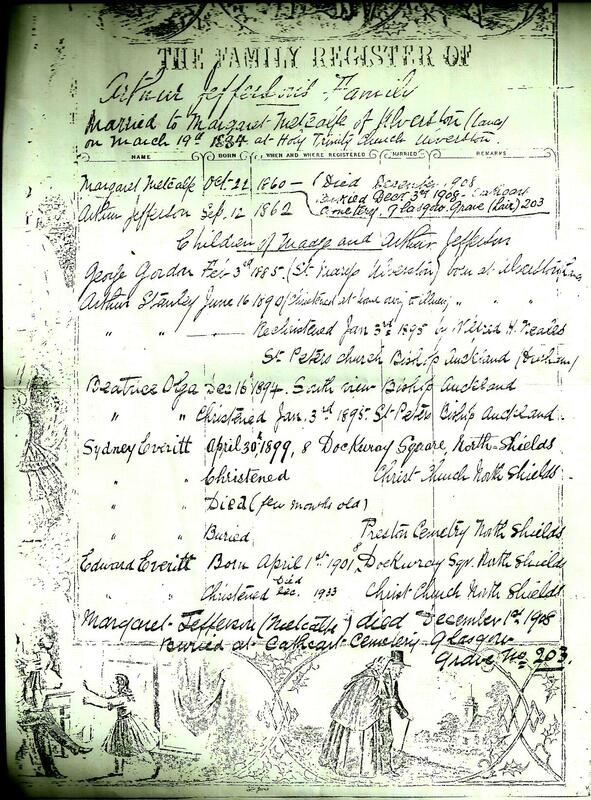 The IGI has the marriage of a William Wilson to a Mary Smith at St Phillip’s in 1810, and several other children of William & Mary Wilson christened there between 1811 and 1825. The birth of Clara Wilson Jefferson was registered in the 2nd quarter of 1851: I presume that she was the 3 day old baby recorded as Mary Jefferson in the 1851 census extract above – probably they hadn't yet agreed on her name. It is surely not a coincidence that Clara and Arthur later gave their father’s name as Christopher Jefferson and that Arthur gave his birthplace as Lichfield? Dix 1858 Mr Alexander Gough, 63 Spring St. It is worth noting that William would appear to have been counted twice in this census, once here as William Gough and once with his sister Clara as William (as we saw earlier). Probably the landlady completed the census details and she may not have been aware that he was away. Although she was calling herself Harriet Gough, legally she was almost certainly still Harriet Jefferson: a search of the divorce indexes at the National Archives from 1858 to 1885 drew a blank (and before 1858 divorce in England & Wales was only possible by obtaining a special Act of Parliament). Harriet's death may have been an impetus for Alexander to make a new will, which he did about 7 months later, and he died in London from influenza in February 1892. His estate was worth more than £20,000, so there was a considerable liability for death duties. At that time, the rates of death duty depended on how closely the beneficiary was related to the deceased: children paid 1%, siblings 3%, etc, rising to 10% for unrelated beneficiaries. Therefore it was important for the tax authorities to establish the exact relationship of each beneficiary to the testator, and this information was recorded in the death duty registers. The death duty register entry for Alexander's estate shows that Arthur Jefferson and his sister Clara Riley were recorded as Str (=stranger), meaning that the maximum 10% rate of duty was payable. Alternative abbreviations Str ND and Str NS (=stranger, natural daughter or natural son) were available to indicate illegitimate children. It has been suggested1 that the fact that these alternative abbreviations were not used in this case proves that Alexander could not have been the father of Arthur or Clara. I am not convinced by this argument. The moral code of the time meant that illegitimate children paid the same rate of duty as unrelated beneficiaries. It is my impression that the alternative abbreviations were simply special cases of “Str” and were mainly used where the will specifically described a beneficiary as a “natural child” (or indeed where the will just stated “son” or “daughter”, but the tax authorities knew from other sources that they'd been born out of wedlock). Apart from Clara, I have not found birth registrations for any of Harriet’s children – neither as Gough, nor as Jefferson. So, either she didn’t register them, or else she used another alias for this purpose. The death of Alice Foster Gough was registered at West Bromwich in the June quarter of 1862, but it is not known where she was buried. According to a Family Register inherited by his descendants, Arthur Jefferson was born on 12th September 1862. So, if my theory is right, he would have been born at Soho Hill about 4 months after Alice’s death. The notices in Birmingham newspapers may have been a desperate attempt by her grieving pregnant mother to persuade Alexander to acknowledge her and her family. A couple of years later Fanny had moved to Leamington Spa, where the birth of her second son Harry Montague Morgan was registered in 1863. Prior to this, she may also have had a daughter named Annie, who probably died in infancy. Alexander's death occurred at Fanny's home in Gloucester Place, which is described in his obituary as his London residence. In his will he instructed his executors to invest £4000 and pay the income to Fanny for life, but as she was already dead her four sons inherited £1000 each on Alexander's death. The will contains a curious request that Fanny should in future call herself Morgan rather than Rogers. The 1891 census extract above suggests that she had already complied with this request before he died. He also instructed his executors to invest £3000 and pay the income to Elizabeth for life. So they were together in two of the three censuses after Bessie reached adulthood and before Alexander's death. This is either a remarkable coincidence, or an indication that she was a very favoured companion. Nonetheless, Bessie doesn’t seem to have had any children, so there is no reason to suppose that this relationship was anything other than platonic! Christopher Jefferson's whereabouts in the crucial period between 1851 and 1871 are not known. However some information has come to light about his life before and after that time. No marriage has been found for a Charles Jefferson to an Ellen, which is easily explained if Charles were really Christopher, who was of course already married. Christopher's landlord in 1892 may well have been a relative of the Muncaster family with whom Charles was lodging in 1881. If Charles and Christopher were the same person (as seems highly likely), then it means that both Christopher and Harriet were in Liverpool in 1871. This raises some intriguing possibilities: had there been an attempted reconciliation? If so, then it must have failed fairly quickly! More likely perhaps is some financial motive: maybe one of them wanted financial support from the other? Or it may be pure coincidence, and they may not even have been aware of each other's presence in the same city. For a long time and despite extensive searching under both Gough and Jefferson (including various possible mis-transcriptions), I was unable to find any trace after 1881 of Arthur Jefferson's brother William Alexander. Since he was not mentioned in Alexander Gough's will, I began to suspect that he had either emigrated or died (or both). In those days, when hygiene standards were not yet sufficient to make it safe to feed babies on cows' milk, it was quite common for wealthier women, who were unable or unwilling to breastfeed their children, to place them with a wet-nurse: a poor woman who had lost her own baby and so was able to sell her breast-milk. Nothing further is known of Mary Ann after 1861 (it is quite possible that she died in infancy), nor of Harriet's 2nd daughter Emily. Clara's son, William Jefferson Riley, of 51 Fairlawn St, Moss Side, died aged 30 and was buried on 21st January 1904 in Southern Cemetery, Manchester.2 His occupation was recorded as Hawker. It is not currently known when or where Clara herself died. Lois Laurel-Hawes of Los Angeles. 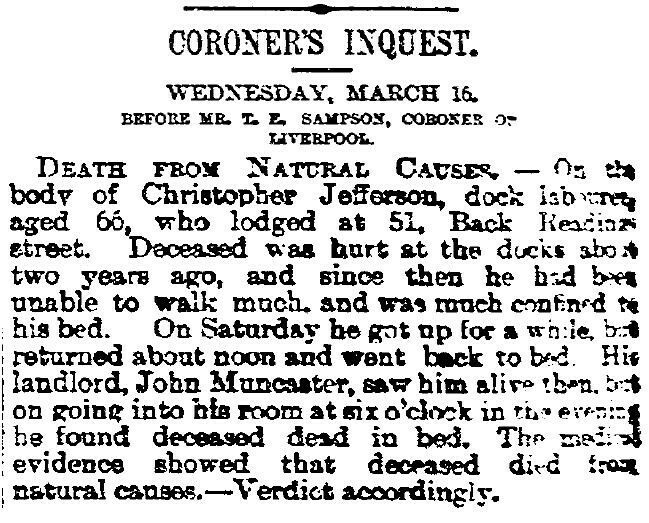 Sydney Everitt - died in infancy in 1899 in North Shields. Arthur's second marriage was in November 1912 to a widow, Venetia Matilda Robinson (née Parry)1, who died in 1941, and Arthur himself died in Lincolnshire in 1949. 2 Information from Ged Parker of Washington, Tyne & Wear. 3 Information from Margaret Hanks of Morwenstow, Cornwall.